exactly where will i find the water and oil line bolts on the s2 na block? does anyone have a decent photo of them? trentZ do a search, look at turbo conversion posts. theres some good posts just do a search. Do you need the Turbo Wiring Loom to do the conversion or can you stick with the n/a loom? Also would an 87 model calais be series 1 or series 2? After June is series 2 and before june is series 1? There is no series 2 by date, just random changes. If your wondering about the motor, look at the passengers side of it and see if the block has the spots for the oil and water lines already there. Wiring loom i'll leave for someone else. Knock sensor would at least be missing from the NA, but lots say it doesn't matter. does a vl n/a turbo 5 speed manual computer work in a non turbo auto vl? Find More Posts by vlcalais! sorry for thread bump but i had this pic from my 30det build which i thought might be useful as i saw few ppl asking about series 1 and series 2 engines. correct me if im wrong witch i have a feeling i am but to do a dodgy conversion couldnt u get away with just manifold turbo cross over ? .. as long as u dont run above 6psi it would work wouldnt it? also when you have the dump on the turbo will it line up to where the cat is on a NA? dump and front pipe will line up with the cat on an N/A, they are the same.. You can run the cross over pipe, but you will still need turbo injectors and ECU to prevent pinging and internal damage to engine. Yes! otherwise why would Nissan produce them with more fuel? PLUS N/A motors have more compression than the turbo motors, even more reason to need more fuel! Has anyone found a trusty head gasket size for this conversion? To drop comp a bit?? Looking at doing this in the next month But with a canary yellow with black bars and trims. Has anyone ever strengthend the MF5 with a completely rebuilt box? Really want to avoid getting a 33 box or having to do the MX conversion. Have the box thats going into it apart for a complete rebuild..
is there a thread on how to do the converson from scrach? can someone pls tell me where l can get water feed from the stock rb30 inlet manifold via t-piece ASAP PLEASE from series 1 engine. CAN THIS hose be used for water feed? attached is a pic below? 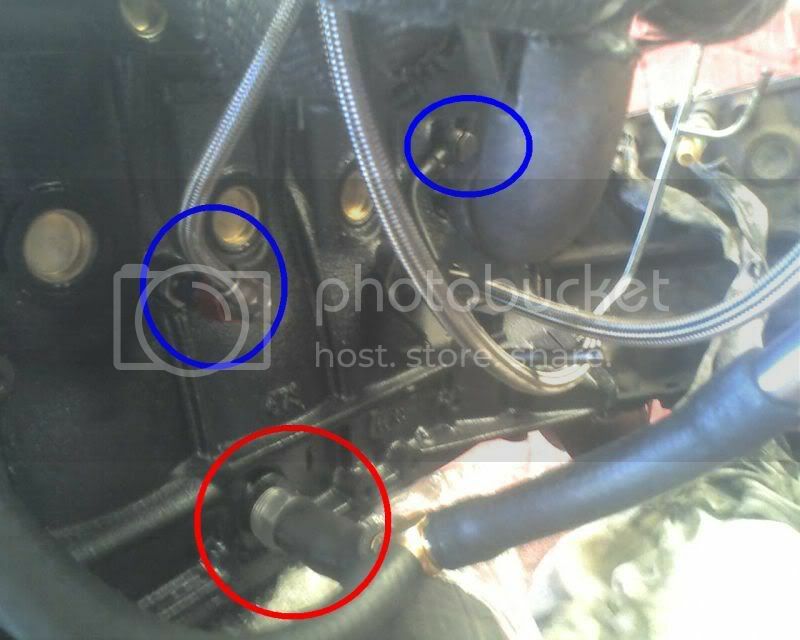 Last edited by FRKVLT; 03-03-12 at 16:10.
thanks mate, so there you go guys who want to turbo their series 1 n/a engine you get water feed from the above pic, water return from the heater hose, oil feed from oil pressure sensor location and oil drain you have to drill on the side of the sump. Good luck hope this can help fellow s1 n/a vl owners. special thanks to WOGPSI for all his help and Wkd VL. Those addresses know who they are. LOL so many dodgy questions. What can I skimp on bla bla bla. Read a Book people find out what detonation/ Pre-ignition and pinking is. Get off your lazy assez and do some home work. If you can't even read the thread you posting in then keep your 'been asked a thousand times' questions to your selfs. This is my first post ever on this site but been reading every thread I can find on na to turbo conversions and it's so frustrating when so many people are too lazy to do some reading and just think people have nothing better to do than type the same answers over and over. So many people on this forum have such a wealth of knowledge and if all these dumb rrses keep posting rubbish the people with the knowledge won't bother helping out. Anyway, Ive just bought a complete turbo motor, everything from fmic to flywheel including ecu, harness and injectors, only need a fuel pump and high pressure fuel line and my pootrol should go a little better. Anyone interested in my conversion I'll prob start a thread on the build. Yeah man go for it, good to see a patrol n a bit of diversity around here. R you Gunna put turbo badges and dose pipe on it lol or go sleeper patrol. certainly not a dose pipe, well not until I'm at 250-280RWKw then I'll be able to justify making a fully sik turbo noise. My Patrol is no sleeper, it's got 7" spring lift, 2" body lift, 36" Simex ET2's and about 1kW of spot lights. I don't think I'll go with the badges, more likely a full body wrap with crazy shizzle all over it. Just cause I can!!!! how are ya mate, im doing a turbo conversion on my 87 calais and i have been serching the forums for weeks trying to find where i can draw water from and return and also oil feed and return i cant find any pics or decent info and so far your the only person offering assistance for anyone stuggling with the conversion is there any way you could help me out possibly mate?